A greener alternative, cork comes from the bark of the Cork Oak tree. The bark is harvested from the tree trunk and branches, and the harvesting does no harm to the tree. The tree then re-grows its bark in about a decade and can be harvested again and again over the tree's life span, which can be over 200 years! Cork makes an excellent flooring product not only for its low environmental impact, but also for its many other unique attributes. 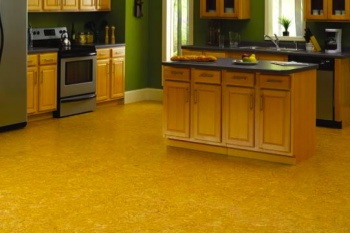 Cork flooring has a wonderful natural beauty, and it is available in a wide variety of colors, textures, and patterns. Cork is a natural thermal insulator. Having cork floors in your home can and lower your heating bills. It naturally absorbs sound, and it can create a great sound barrier from noises inside and outside. This makes cork a good choice for places like churches, libraries, and recording studios. It is soft and quiet underfoot, and its shock absorption is good for people with joint concerns and for the occasional falls of children. This makes it a great flooring choice for playrooms or places where people are on their feet for long periods of time. It is very durable and resilient. The millions of tiny air pockets in cork that give it many of its unique performance attributes also allow it to spring back to its original shape after being exposed to weight and pressure. It is naturally hypoallergenic, and it does not absorb dust. It maintains a comfortable surface temperature. A polyurethane sealant can be applied to make it suitable in wet areas like kitchens and bathrooms.